If you're looking for something unique to please that favorite boy or girl in your life, here's a cute idea to try! Plus, it's quite perfect for the Easter season. 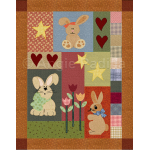 Use different fabrics for each block, for a neat scrappy look. Finished size: 19 x 35"
These cute bunny girl and boy will probably become a favorite of a special kid! Use the blocks for.. 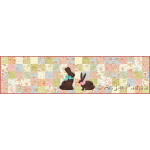 Whether you choose to use soft pastels or bright, vibrant fabrics, only three very easy shapes mak..
Add a special touch to a scrappy table runner with some calorie-free chocolate bunnies! Dig around y.. 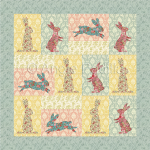 This trio of springtime bunnies in a scrappy setting are perfect for Easter or for that special to..